Western Michigan University Student is recipient of second annual Voice Aerobics® Student Scholarship. The Voice Aerobics® graduate student scholarship is awarded annually to a student who demonstrates positive character traits and intention to make a positive contribution to the field of Speech-Language Pathology. 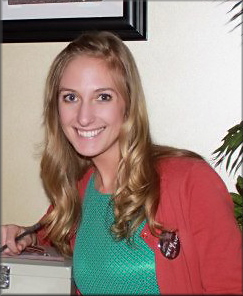 The 2013 recipient is Kaley Gerke, a first year graduate student at Western Michigan University in Kalamazoo, Michigan. The student scholarship award was begun as my way of giving back to a profession that I love, to support student clinicians who represent the future of the field, and as a way of affirming the continued success of my business. Thank you to everyone who took the time to contact me and submit an application. Acceptance of applications for next year will begin March 1, 2014, with a deadline of April 30, 2014.